Roulette conducted by a real Croupier and using the same gaming equipment (ie Roulette wheel and ball) utilized in traditional land based casinos, but played online. Vision of the game is streamed live to your PC allowing you to play the game real-time. Almost all online casinos offering live games have at least one Roulette variation to play. The below casinos all offer at least one form of single zero roulette, whether it be European, French or Asian. Yes. For a start there are quite a few different roulette variations and each has a different table layout and/or wheel configuration. Further, different casinos license their live gaming software from different developers so the interface look and feel and functionality will differ slightly from one casino to the next. You can find a nice comparison of roulette games across a compete range of major platforms at this live online roulette site. Roulette really is a very simple game. You have a table layout giving you a range of bet options. 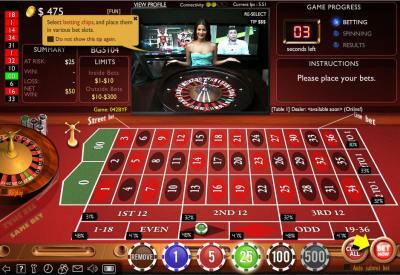 The table layout will correspond to the numbers on the Roulette wheel. You simply place your bet on the table, and if the ball lands on a number included in your bet, you win with a prescribed payout. I don’t intend to go into the rules of roulette in depth at all. Other than to say that the rules (bet payouts) applied at live casinos are consistent with corresponding traditional casino rules for that variation. The main variations offered at live casinos are: European (most common), French (less common), Asian (less common) and American (one casino we know of). These are considered further below. Live online European Roulette: Single zero roulette, offering better odds than the American form of the game. This is the most common form of the game offered live. The sceenshot below is from a game played at William Hill. 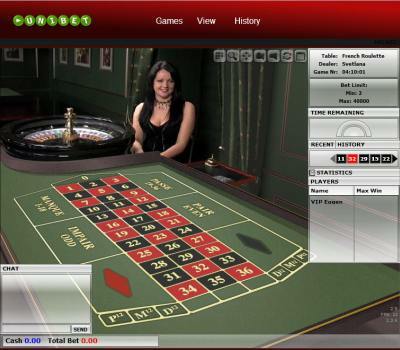 Live online French Roulette: Also a single zero roulette game, but with a different table layout to European Roulette. Neighbour and Announced bets are accessible playing this game. A few live casinos offer French roulette. The belwo screenshot is taken from Unibet. 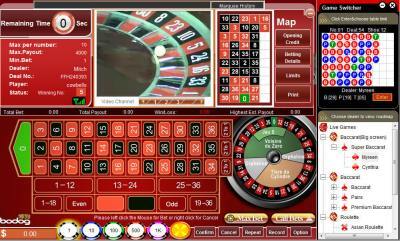 Live online American Roulette: This version of roulette has 2 zeros, making it a high house edge game that the other variations on this page, so probably best avoided if possible. The below screenshot was taken at BetPhoenix. 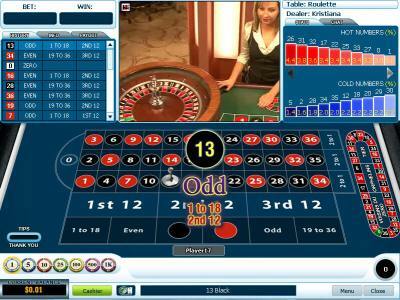 Live online Asian Roulette: Another single zero roulette game, again with a slightly different wheel and table layout. Offered at a bunch of Entertasia (software developer) casinos, including Bodog 88.